Home News Headed To State Duncanville 44, Allen 35. 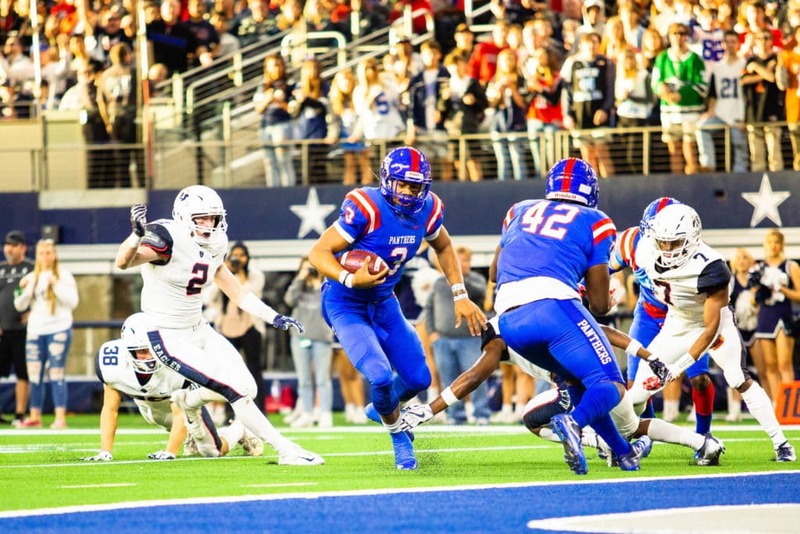 Before a large crowd Saturday at ATT Stadium, Duncanville represented quite quickly who may be the best 6A football team in the state, if not the nation. 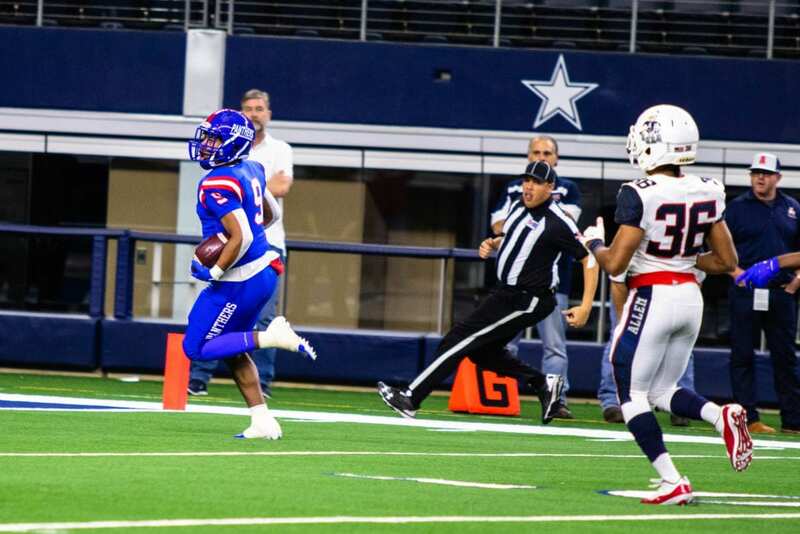 On Duncanville’s first possession and first play, running back Trysten Smith took the ball across the right side and sprinted 73 yards for a TD. The PAT by Victor Escalona was good. In a matter of minutes Duncanville led 7-0. Smith would have 15 carries for 130 Yards for the game. Allen fans were stunned, along with their team. But Allen kept their composure. Allen had come into the game on a 30-game win streak. They were the state champs and several polls had them ranked the best high school football team in Texas. One poll even proclaimed Allen the best team in the country. On the next possession, Allen proved their greatness. Quarterback Grant Tisdale connected with a 62-yard pass to Theo Wease for a score. PAT by James Griffith was good. Game now tied 7-7. Tisdale had 29 carries for 91 yards while Wease had 6 receptions for 102 yards, scoring two touchdowns for the Eagles. 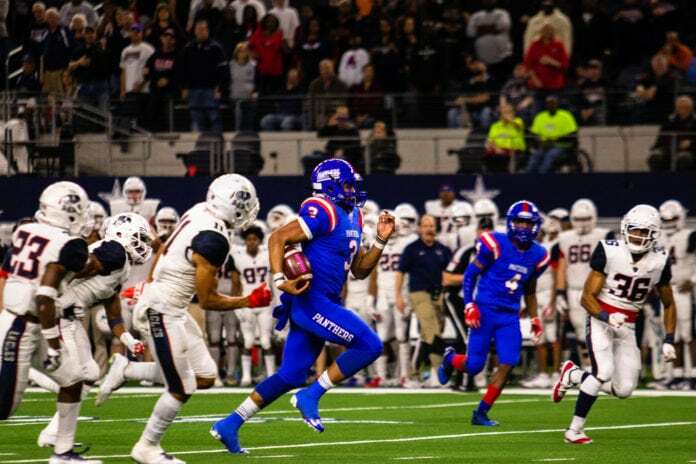 Duncanville scored a final touchdown in the quarter on a Javon Fountain 21-yard run. PAT was good. Duncanville led the first period 14-7. Allen scored first in the second quarter on a Tisdale pass for 21-yards to Wease. Game was tied 14-14. Tisdale went on to throw 21-35 for 236 yards for the game. Then the Duncanville offense broke the dam. Duncanville scored three unanswered touchdowns by the half. Ja’Quinden Jackson scored two of those touchdowns; one on an 8-yard run and another on a 92-yards scamper. Both PATs by Escalona were good. Jackson had a total 173-yards on 16 carries for the game, throwing 8-12-0 for 54-yards in the air. As time was waning in the half, Jackson hit Daveon Walker on a 32-yard TD pass. PAT was good. Duncanville led at the half 35-14. Allen came out on fire the second half. In fact, by the end of the third quarter, Allen scored three touchdowns to tie the game at 35-all. The third quarter belonged to the Allen Eagles. With hardly a Panther whisper. Allen’s first score came on a fake punt. Eagle Justin Hall on a fourth and long took the ball and raced 60-yards for the touchdown. Tisdale threw a pass to Darrion Sherfield for a 36-yaard score. And finally, Celdon Manning had a 15-yard run for a score. All PATs were good. Third period ended 35-all. With three minutes left in the game, the Panthers were driving. On fourth down and two to go for the first, Coach Samples put the fate of the Panthers in the hands of junior quarterback Ja’Quinden Jackson. Jackson took the ball and ran straight at the gap in the line. He was through in an instant. He sped past the line backers before they could react. Only the deep backs had a chance. He was so fast and running so strong they could not catch him, but only fell into his wake. He scored uncontested, and PAT was good. Duncanville 42-35. Less than two minutes left in the game. Allen was backed up against their own goal line. Frustrated because they couldn’t complete a deep pass. Duncanville’s defense was swarming, led by senior defensive lineman De’Braylon Carroll. 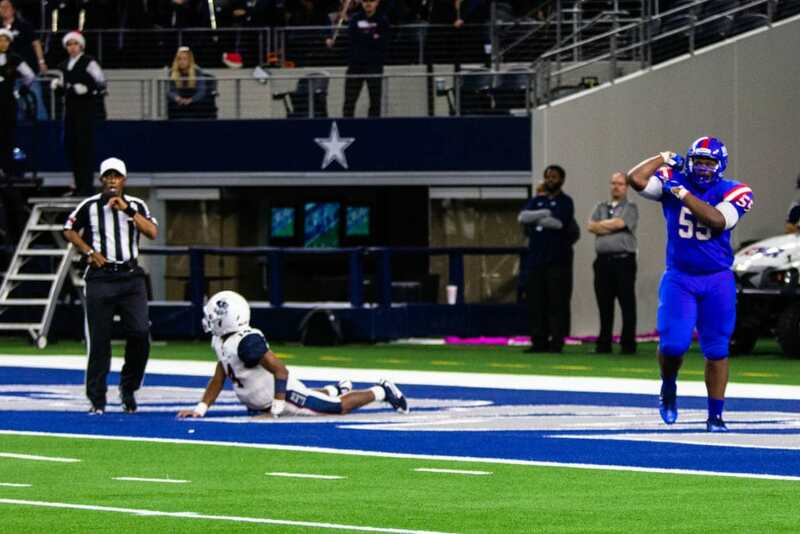 With the seconds ticking away, I don’t imagine that a single Duncanville player was thinking about how they had scored 674 point this year while they only had allowed 60 points. That averaged to 4.6 yards offense and 130.5 yards per game. The defense probably didn’t recall that they had scored more points than the total offense of their opponents. All every player and fan knew was that they had to get the quarterback. And by golly they did. In the end zone. Safety, 2 points. Thank you De’Braylon Carroll. Final score Duncanville 44 Allen 35. Game next Saturday at ATT Stadium at 7pm. Duncanville vs. Galena Park North Shore.